AMERICAN CITIES | THE NOT DEAD YET GENERATION! This quintessential midwest city, with a reputation as white bread and milquetoast, has come into its own in the past few years, reaching its highest notes hosting the 2013 Super Bowl. Several years ago, Indianapolis had literally no character and was simply a conservative place for raising kids and working for the Eli Lilly Company. Reaching into the increasing bank roll of “amateur” athletics, Indy found its identity as one of the sport’s capitals of the world, and an urban center rose up from the prairie and the flatlands. Today, Indianapolis is a thriving, growing metropolis and a surprisingly fun holiday location while maintaining safe city streets and a staunch midwest sensibility. 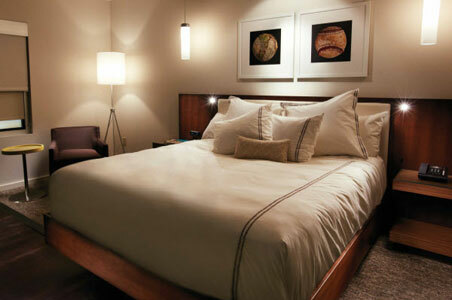 There are many hotels that may meet your needs in Indianapolis. However, there has to be something special for lodging to receive the NDY™ recommendation. Thus, the NDY Generation™ has only three hotels to suggest in Indianapolis. The rooms, conservatively decorated, while not adhering to the NDY™ preference for cutting edge, modern design, are large and well done with plush chairs and a comfy bed. Bathrooms are commodious, with separate tub and shower utilizing top-notch Grohe fixtures. The thick towels, TV, ample hot water and excellent storage made for a luxurious bathing experience. Service at this Conrad is excellent and it is a well-managed hotel top to bottom. Everyone addressed you by name, providing the personal touch and the ubiquitous “sir,” was hardly ever used. Location, in the very heart of Indianapolis’ entertainment district was superb, and the double pane windows kept any celebratory noise out. You are within walking distance of all the stadiums, arenas etc. and good restaurants are right there, with the very popular Tastings wine bar and the Capital Grille attached to the hotel. The venerable steakhouse, St. Elmo’s, is around the corner. The NDY Generation™ has only have one issue with the Conrad. Unfortunately, the hotel charges an exorbitant non refundable amount to have your dog with you. This makes the Indianapolis Conrad as expensive as a five-star New York hotel. Since many NDY™ folks consider their pets an integral part of the family, the NDY Generation™ encourages all hotels to accept a refundable deposit as “insurance” for any damage a pet may cause. The “check out” may take longer, but NDY™ sees this as an acceptable compromise. The Conrad, in spite of its pet policy, gets the NDY™ recommendation. Opened in January of 2013, and considered Indianapolis’s first “art hotel,” The Alexander happens to be a poor cousin to Louisville’s 21 C, New York’s Gramercy Park, or the Encantado of Santa Fé, but NDY™ gives The Alexander credit for rising above the mundane. Providing 157 Ikea inspired minimalist rooms, The Alexander stands across the street from the Bankers Life Fieldhouse (the former Conseco Fieldhouse), home to the NBA Pacers. This is an emerging area of Indianapolis within walking distance of both the downtown restaurant – bar scene and the Eli Lilly headquarters. The excellent Cerulean Restaurant of Winona Lake fame, has become part of the hotel and Plat 99, the bar off the lobby, is a NDY™ recommended lounge with excellent drinks and a small plate menu. The NDY Generation™ wants to emphasize that The Alexander is not a luxurious hotel in the same vein as The Conrad and its prices reflect that. However, this is a very cool place to rest your head and The Alexander is accommodating for the NDY Generation™. Unfortunately, The Alexander does not meet the NDY™ standards as a pet friendly hotel. A non-refundable deposit is required. The NDY Generation™ finds this reprehensible and suggests a refundable deposit instead. Again, do not expect sumptuous accommodations and five-star service, but as a moderately priced, trendy hotel, The Alexander gets the NDY™ recommendation. 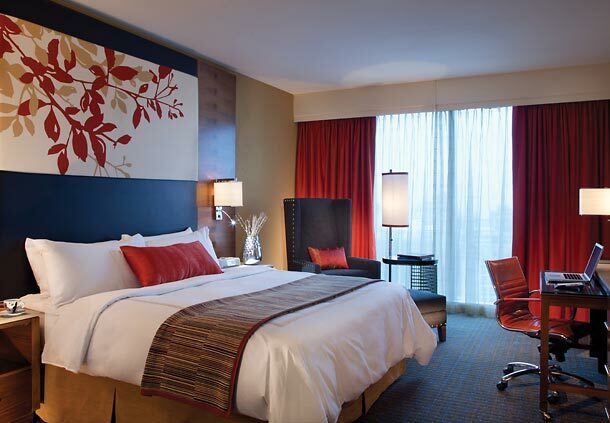 The upscale JW Marriott chain may be considered Indianapolis’s premier convention hotel. Located close to the city’s convention center and downtown, the JW is sport’s central for the plethora of athletic events held in Indianapolis. It is always hopping and because of its commotion and large-scale operation, this hotel has to work hard to get a NDY™ recommendation. However, the JW Marriott provides fine accommodation for Indianapolis. The lobby bar is a wonderful place to strike up conversation with folks visiting from all over the world. It is also a spot to eye sport celebrities who frequent the Marriott. Having over 1000 rooms, be prepared to occasionally wait for a desk clerk or an elevator. The rooms mirror what you would find in the other JW Marriott’s around the world. They are a nice size, designed traditionally with modern amenities and have a serviceable bathroom. Not cutting edge certainly, but the accommodations will meet the NDY Generation’s™ needs well. A fairly decent and quite popular Italian restaurant, Osteria Pronto, is part of the hotel. Pets are not allowed or tolerated at the JW Marriott. This is rather common at convention hotels unfortunately. As Indianapolis grows and new hotels are built, the JW Marriott may not make our list, but for now the JW Marriott gets the NDY™ recommendation. 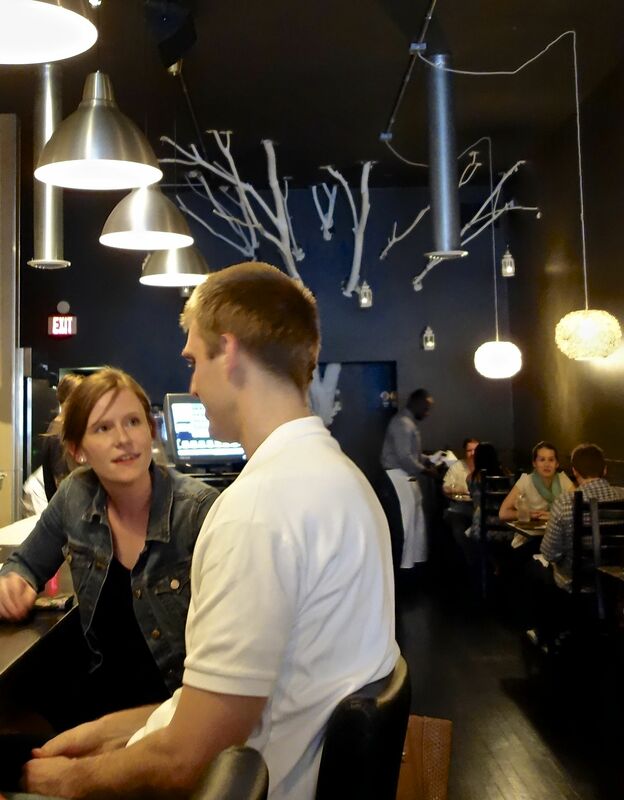 Indianapolis is just beginning to attract creative and exploratory chefs to the city. As a result, there is not plethora of NDY™ recommended restaurants as of April 2013. The NDY Generation™ has tried the dining establishments that are considered Indianapolis’ finest. Yet, even such highly rated restaurants as Oakley’s Bistro and Recess did not make our list. Oakley’s Bistro was much too staid and boring. Recess was quite taken with itself and the kitchen’s timing was excruciatingly poor. NDY™ will reevaluate these restaurants and while Indianapolis continues to grow as a world-class city, NDY™ is sure our list will also grow. While NDY™ loves food and eats out extensively, these reviews will not consist of a precise deconstruction of the food. Every palate is different, especially as you age, and thus the NDY Generation™ will not analyze every dish and bite. We will simply evaluate restaurants based on comfort, food, and if it has that NDY™ something. This is the restaurant that will propel the city’s dining scene to Michelin status. While not ornate, fancy or pretentious by any stretch of the imagination, the food coming from Bluebeard’s kitchen can compare well to any of the new restaurants springing up around the country. Initially, NDY™ was skeptical. Bluebeard does not take reservations and it is not within NDY™ permissible standards to stand at a crowded bar for hours waiting for a table. Yet, Bluebeard accommodates patrons by taking your phone number, directing you to a friendly neighborhood establishment or two, and calling you when your table is ready. Since the Fountain Square area of Indianapolis is one of the most interesting and vibrant happenings in town, the system works perfectly. The bar at Bluebeard’s has electricity and is fun for all ages. While the seats were uncomfortable and the spacing narrow, the warmth of the staff and the incredible mixologists made us forget any discomfort. Dining was superb and the room is alive with laughter and camaraderie. NDY™ ordered the duck comfit Caesar Salad which was absolutely sublime with an exciting flavor profile that actually “popped,” rare for a salad. The marinated squid, while avoiding the more common smokey flavor of charred grilling, had a very light Mediterranean touch. We enjoyed the chicken liver pâté, but it was so rich, NDY™ couldn’t finish the portion, and we adhere to the “clean plate club.” The home-made pastas were great, rivaling the best Italian restaurants on either coast. Desserts were too good, and the NDY Generation™ is happy that we also adhere to gluttony. Bluebeard is most definitely, a NDY™ recommendation. Located in the NDY™ recommended Alexander Hotel, Cerulean is another impetus for the “coming out” of the Indianapolis dining scene. 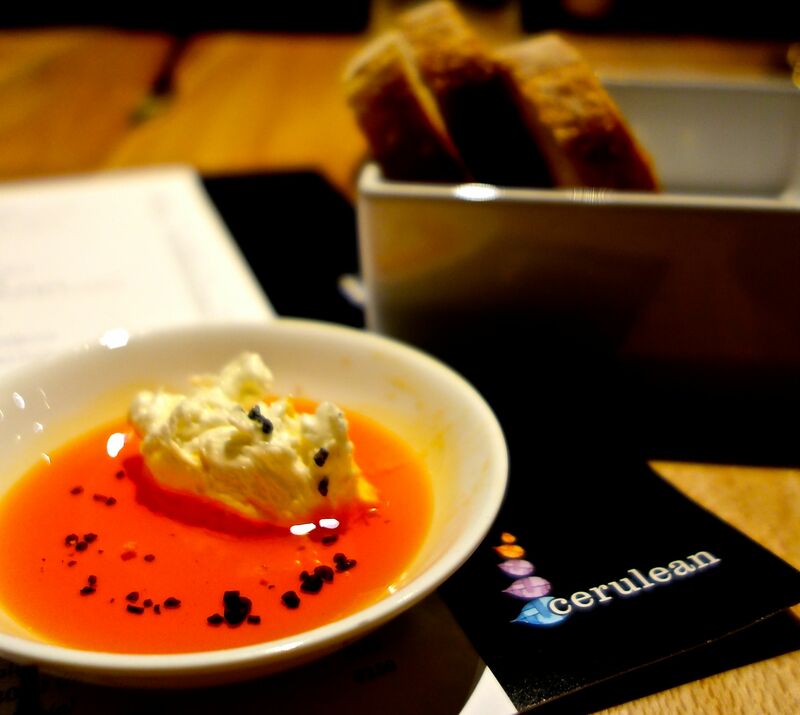 Caleb France, the young chef and part owner, has already tasted success at his two establishments in Winona Lake, Indiana, but Cerulean is where he is tossing caution to the wind, providing Indianapolis with its most unusual and innovative cooking. Certainly, Chef France’s talent is evident with each creation, however the final evaluation for any restaurant is how the food tastes, and the cooking is more miss then hit at Cerulean. NDY™ appreciates experimentation in the kitchen, but not at the expense of the diner who is not only footing the bill, but is the chef’s ultimate audience. Too often innovation morphs into self-indulgence and I’m afraid that is the path Cerulean and Chef France has taken. The rhubarb cinnamon crumble looked gorgeous, yet would have more purpose as an amuse bouche rather than an appetizer. While the corn macaroon was another major artistic consummation, the pork belly swamped all the other flavors making the dish one-dimensional. On the other hand, the chickpea fritter was out of this world, bursting with flavor. The entrees were also inconsistent, ricocheting back and forth between greatness and mediocrity. Interestingly, there is an obsessive, and perhaps compulsive need to create dishes that have a lingering sweet after taste. NDY™ found this quite disconcerting. Cerulean surrounds the diner with a casual ambiance that consists of different rooms on different levels with large windows opening on to the patio or street. The coup de grâce is what Cerulean calls the “nest”, a cocooning art installation with seating inside. Reminiscent of the Beijing Olympic’s now iconic “Bird’s Nest” sports arena, it is startling interior design within an other wise tepid decor. NDY™ found the lighting horrific, with many of the tables bathed in shadow and darkness. This seemed to be more a fault of poor design rather than an attempt at mood lighting. Cerulean has a nice bar and the drinks match the food for creativity. 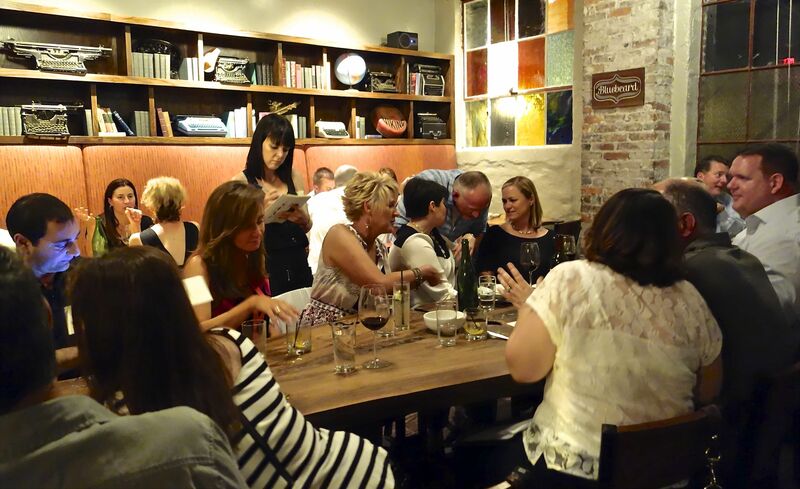 Service was fantastic and NDY™ felt the staff’s excitement and passion toward their ground-breaking restaurant. In spite of its inconsistencies, Cerulean gets the NDY™ recommendation. We applaud the innovation and the risk involved bringing this evolutionary cooking to Indianapolis. With more concern about the diner, and less concern towards force feeding inventiveness on Indianapolis, Chef France and Cerulean will take this city to unventured culinary heights. Anchoring the tail end of Mass Ave like a caboose, Black Market is easy to miss, but that would be an utter shame. Like a little brother from another mother, Black Market resembles Bluebeard in many wonderful ways, but with a “less is more,” Mies Van de Rohe, style of cooking. Co-owner and chef Micah Frank would probably take offense to any association with modernism as he describes his cooking as grandmother food. However, this grandma drives a Porsche and wears Manolo Blahnik stilettos! The daily pickle appetizer has nothing in common with the cucumber, as radishes, eggs, leeks, peppers etc. are pickled and seasoned with a variety of exotic spices. This is deconstruction at its finest with none of the pretense of molecular gastronomy. Welsh Rarebit, by definition a vestige of the past, is served at Black Market with a pungent cheese sauce, leaving all reminders of a pedestrian grilled cheese behind. The influx of the gastro pub phenomena has brought back Wiener Schnitzel with a vengeance, but Black Market’s schnitzel is as good as anything in Berlin or Vienna and will have you donning lederhosen before you know it. Most of the seating in the restaurant is communal, a trend not endorsed by the NDY Generation™. We find communal seating a forced intimacy which is often uncomfortable for the NDY Generation™. School cafeterias are a forgotten memory and something we do not want to be reminded of. (Remember the socially enforced segregation?) Black Market serves food made with heartfelt warmth, a sincere concern for sustainability, and a devout farm to table mantra. Chris Coy, the general manager, brings a Steven Jobs intensity to the cocktail side of the equation, going way beyond creating his own organic mixers. His concoctions take a mad scientist approach to mixology, reminding NDY™ of Dr Emmett Brown from the “Back to the Future,” movies. After a few of Chris’s drinks, you feel like you traveled back to the future. They are tasty, unique and potent. Black Market Restaurant gets a resounding NDY™ recommendation. Thirty minutes from downtown and steps from Indianapolis’s fanciest mall, Late Harvest’s extraneous welcome is totally nondescript and blandly suburban. Yet, once diners step inside, a lively and festive restaurant emerges. Late Harvest Kitchen is a very popular restaurant, but reservations shouldn’t be an issue because this is one heck of a large space. In fact, the main dining room seems hollow, in spite of an obvious attempt to create a warm space. The fireplaces, wood tables, and the predominant finishes lack soul and are a bit too Ramada Inn for the NDY Generation™. However, if you can cop a seat at the small bar or the lovely outside patio, fire pit included, you will feel light years away from a suburban mall. Opened by the James Beard touted chef Ryan Nelson of Oceanaire fame, LHK displays his obvious talent in such menu items as his Branade appetizer, house baked Brioche available to dip into a succulent cod purée, and a star entrée, savory lamb shoulder ravioli, which might be the best pasta dish in Indianapolis. A whole fish is offered every night even though the menu is updated every week. Diners were swooning over Chef Nelson’s pork chop, which looked Fred Flintstone size. Where Late Harvest Kitchen fell short was consistency and timing. NDY™ has noticed that many restaurant kitchens, in their attempt to be innovative, take too much time between servings. An appetite is mortally wounded by even a 30 minute delay before the next serving. NDY™ doesn’t expect kitchen staff to maniacally run around mimicking the TV’s “CHOPPED,” but timing is so darn important to the success of a restaurant. Also, Chef Nelson’s skills fell short on a few of the dishes. The hand cut fettucine was bland and tasteless. While the whole Bronzini was obviously fresh, it didn’t stand out above the crowd of Bronzini’s being prepared in what seems like half the restaurant kitchens in the world. Bronzini must be in vogue. All the sides are priced additionally, like in a steakhouse, but the soggy nondescript hand cut fries were not worth the extra eight bucks. NDY™ wished the bar had more than eight seats since the cocktail selection was fab. Late Harvest Kitchen, is an excellent restaurant with some ups and downs. Hey, nothing’s perfect. The crowd leaned towards a bit “blue hair” and stuffy, but generally the diners consisted of an eclectic age group. Late Harvest Kitchen gets the Not Dead Yet Generation’s™ recommendation. The NDY Generation™ wouldn’t usually recommend a steakhouse since many of them follow the same patented format with a masculine ambiance, lots of wood, strong cocktails, and huge portions. St. Elmo’s is no different. Yet, it is so utterly iconic in Indianapolis, we are compelled to recommend St. Elmo’s. 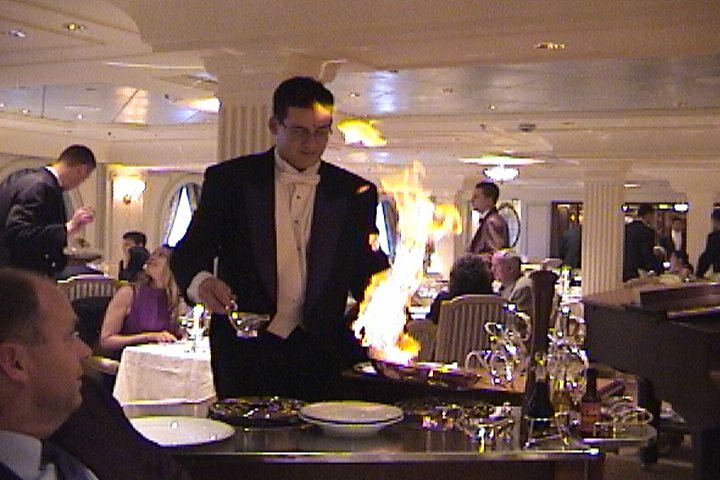 The menu is filled with the steakhouse favorites; New York Strip, Filet Mignon, Porterhouse, Rib Eye, etc. Prices range from a steep $52.95 for the 24 oz Porterhouse to $24.95 for roasted chicken. For those of you not wanting to dig into a big piece of carrion, seafood is offered with lobster tail and a catch of the day among the choices. Profit margins grow for steakhouses of this genre as all sides and salads are à la carte. St Elmo’s famous or infamous, depending on your palate’s tolerance for heat, shrimp cocktail has gained fame for the size of the shrimp and its sinus clearing horseradish sauce. 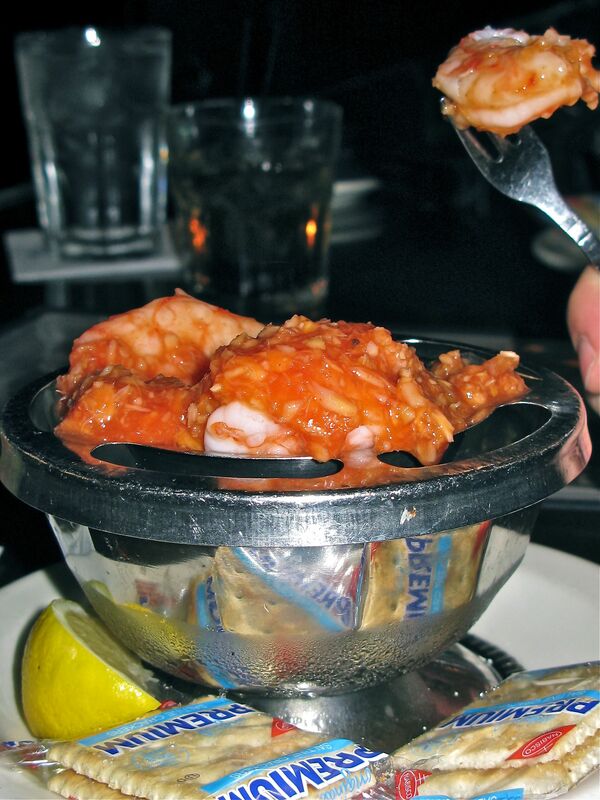 The NDY Generation was not overly impressed with this shrimp cocktail and really didn’t understand all the hype. Desserts are your usual humongous steakhouse fare. St. Elmo’s is part of the extended family of locally owned steakhouses that proliferate throughout the U.S. Cincinnati’s Jeff Ruby’s, Chicago’s Gibson’s, Bern’s in Tampa, Killen’s in Texas, Peter Luger in New York, Beverly Hill’s Cut, Elway’s in Denver, Prime One Twelve in Miami, Gorat’s in Omaha, the Golden Ox in Kansas City, Jackson Grill in Milwaukee, KO Prime in Boston, will all offer great meals, strong drinks, and impacted abdomens. They are icons for their respective cities and will provide an excellent, macho dining experience. They aren’t that unique, but like a close family, will always be there for support. Mesh makes the most of being on Massachusetts Avenue, Indianapolis’s answer for an artsy, bohemian neighborhood with cool restaurants, boutiques and bars. In fact, the exact name is “Mesh on Mass Avenue,” thus exposing their marketing strategy. At first, Mass Ave seems like a young, hipster hangout, and NDY™ was about to flee, but don’t let the kids scare you. All ages are welcome and NDY™ never felt “on the outside looking in.” Mesh Restaurant is a perfect example of this acceptance. It just looked too hip for the NDY Generation™. We were greeted with smiles, warmth and an actual appreciation for our patronage. While the food will never be considered great or daring, it is quite good and the scene is fab. The fish tacos had a nice bite and were not bland like so many fish tacos NDY™ has eaten. Chicken Scallopini can be a recipe for disaster, but Mesh’s version was delicious. The fries, burgers, salads, etc. may have lacked a certain finesse, but they all tasted great and what else do you need when there is so much fun and eye candy around. Mesh may not make any “top ten” list and it will never be awarded a Michelin star, but the food was tasty and NDY™ had a great time. Mesh is both a NDY™ recommendation as a dining and drinking destination. While “the Goose” is not a restaurant as we know it, the morsels that are available for take out are so incredible, NDY™ feels compelled to recommend “the Goose” as a dining destination. A misleading tiny gourmet grocer at first glance, Goose the Market is a neighborhood gathering spot and produces some of Indianapolis’s finest food. The “menu” is a “who’s who” of charcuterie. Using only the best of local production, the air-dried prosciutto, wood-smoked meats and dry-cured hams will make you feel as if you wandered into a European town and left American mass production behind. 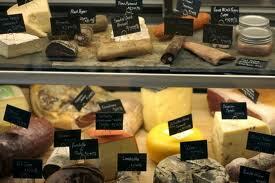 The cheeses and meats are simply fantastic while the staff is helpful and know their stuff. Plus, you don’t need a passport! Samples are provided with a smile. Down the rickety stairs is a wine bar with bottles for sale. NDY™ was not very impressed with the wine, but hey, you need some vino to drink as you keep shoving delicious charcuterie in your mouth. The Goose is an Indianapolis must see. Okay, let’s get this out-of-the-way, nothing compares to a New York City delicatessen. Whether you favor Katz’s, the Carnegie, 2nd Avenue, Artie’s, the Chiffon, or Mill Basin, they are all the best in the world and that’s that! However, Indianapolis is in the Midwest, and Brooklyn, Queens and 2nd Avenue may as well be in the Afghan Kush. Shapiro’s does deli well and unless you live in New York, their pastrami, corned beef and babka are pretty darn good. There are now two Shapiro’s, but if you are visiting Indy, go to the original, a bit south of downtown. 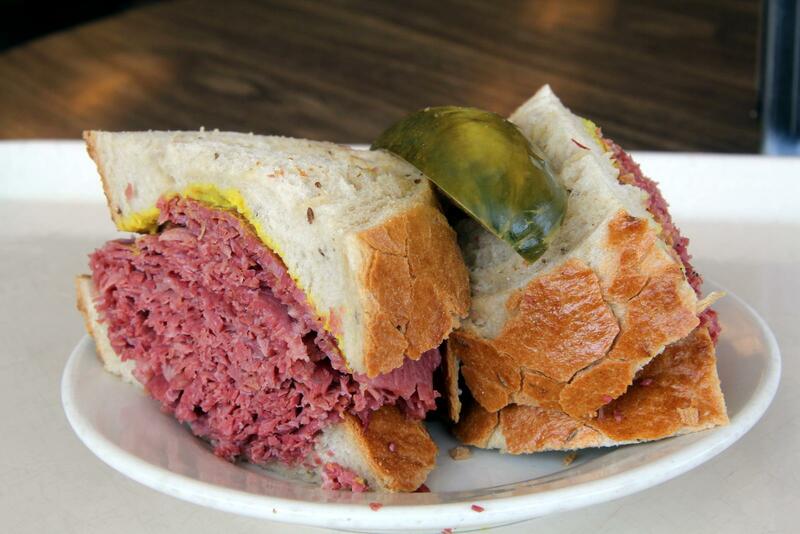 In the same vein as Katz’s, the downtown location is “cafeteria style,” and you line up while placing orders. Shapiro’s has its own bakery, and their bread and baked goods are excellent. Oy vey, I know Shapiro’s ain’t Katz’s, but it is a NDY™ recommendation. The NDY Generation™ is going to be extremely selective before an establishment receives our recommendation. We are searching for places that have something special, a unique hipness that does not exclude the NDY Generation™. Thus, those clubby joints or the ubiquitous Irish pub will only make our list if they have a certain panache, a “je né sais quoi”, if you will. Remember, we are the Not Dead Yet Generation™ and we demand to be an integral part of the trend! 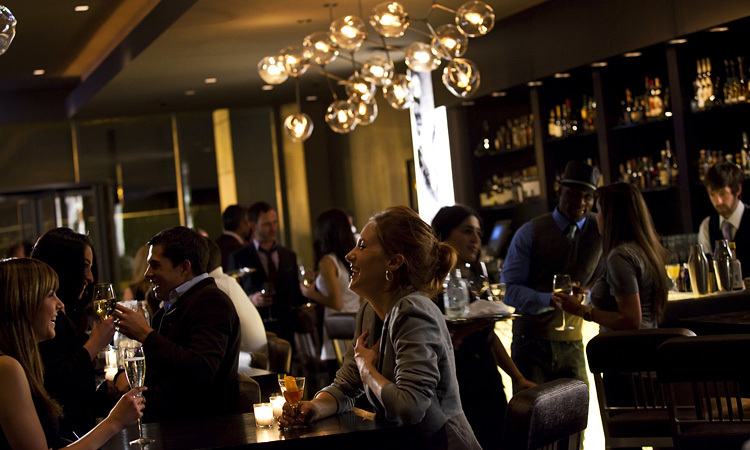 The Libertine is a very trendy lounge with a downtown location. Ambiance is created by having everything done in dark colors, making it difficult to notice that the Libertine makes no attempt at cutting edge design. There is a cave like look to the place except for the antique bar which is quite stunning. If you sit at the bar, the oppressive and gloomy color scheme fades away. What makes the Libertine special is the wonderfully engaging and talented bartenders. They make you feel welcome before you even sit down. Their skill mixing cocktails could compete with the best, and the barkeeper will make sure you have a good time. While the crowd tends to be young and trendy, all ages are embraced with congeniality and the music isn’t harsh or obtrusive. The Libertine is touted for its lounge food, but unfortunately, NDY™ was very unimpressed except for the bacon flight, which made us want to oink with pleasure. The Libertine is a sophisticated addition to the Indianapolis downtown scene and a NDY™ recommendation. Located off the lobby in the NDY™ recommended Hotel Alexander, Plat 99 was designed by the renown installation artist Jorge Pardo, whose Latin inspired decor is reflected in the edgy tile flooring and the Chihuly like glass lanterns hanging from the ceiling in a galactic artistic display. Large windows let the light pour in and the second floor location allows for a wrap around terrace that simulates a roof top bar atmosphere. The Alexander Hotel is located across from Bankers Life Fieldhouse (the former Conseco Fieldhouse), home of the NBA Pacers and part of the 155 million dollar CityWay Project that is rapidly gentrifying an area close to the Eli Lilly Pharmaceutical Company. Plat 99 will be an integral part of this development and has become a vibrant social destination for Indianapolis. 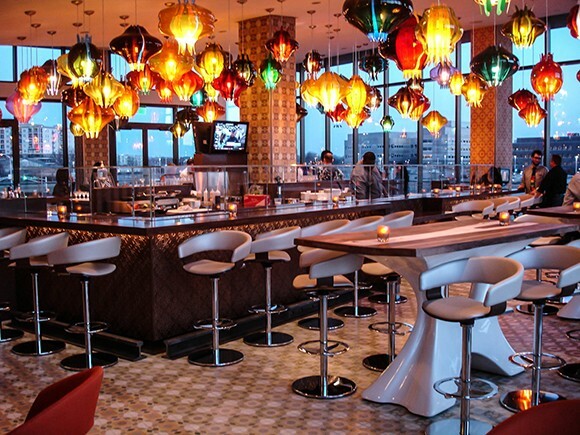 Managed by the Libertine alum and award-winning mixologist Michael Gray, Plat 99’s drinks are memorable and fun. NDY™ was impressed with both the atmosphere and service at Plat 99 and we heartily give Plat 99 our recommendation. Often, both restaurant and hotel bars will meet the needs of the NDY Generation™. However, to get the NDY™ recommendation, an establishment must be extra special in some way. Bluebeard fulfills the NDY™ criteria. Don’t be put off by the uncomfortable chairs and the narrow spacing, nudge yourself in and settle down for a great time. 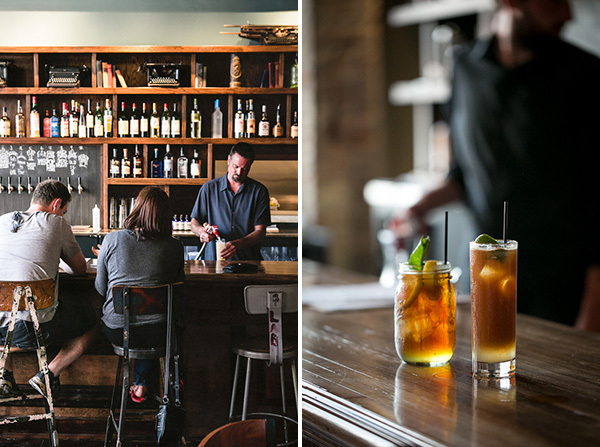 Bluebeard’s bartenders are warm, fun and worldly, able to engage in conversations on a variety of subjects. The drinks are interesting and mixed with a “healthy” amount of alcohol. An eclectic crowd fills the room and sounds of frivolity and satisfaction abound. If you get a bit hungry, have no fear as Bluebeard is a NDY™ recommended restaurant (see above) as well as a recommended bar for us NDY™ers. This is Indianapolis’s most touted bar having just been mentioned in Esquire’s “Best Bars in America” article. 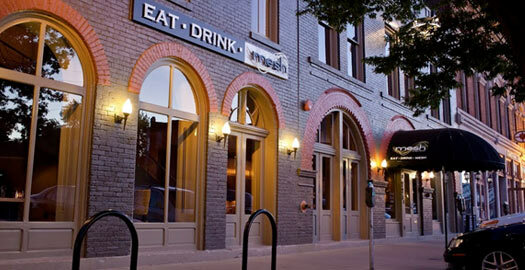 Located on Massachusetts Avenue, home of the NDY™ recommended Mesh, the B & B is a part of the Mass Ave. revival and one of the many bars, restaurants, boutiques etc. that make Mass Ave Indys go to hipster hangout. The B & B serves great drinks and has a great reputation, but NDY found the service cold, preemptory and the atmosphere reeks with a shallow “meat market” ambiance. 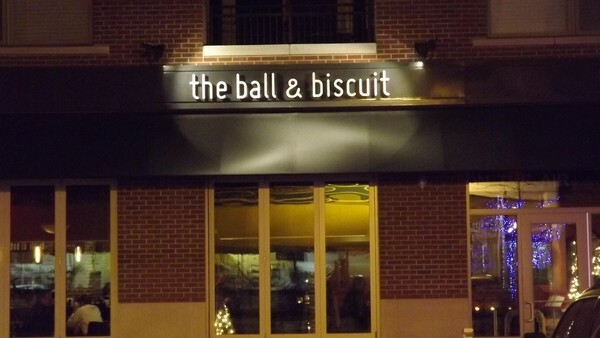 As a result, in spite of its stellar reputation, the Ball and Biscuit does NOT get the Not Dead Yet Generation recommendation. This is probably the most unassuming and unpretentious jazz club in America. 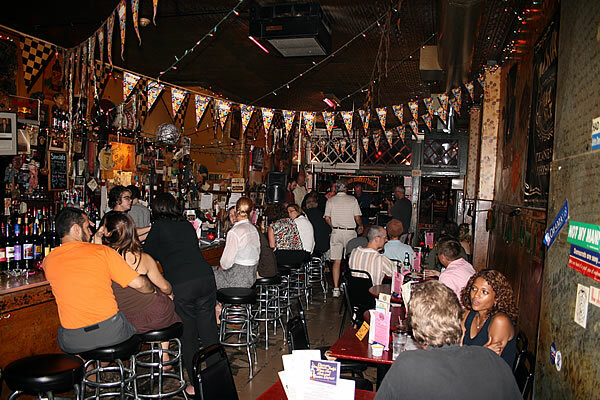 Located on the aforementioned and esteemed Massachusetts Avenue, The Chatterbox attracts some very good, mostly local musicians to play on their minuscule stage. The ambiance is reminiscent of a fifties era Polish cruise ship trolling the waters of the Baltic Sea. Maybe because of this, the Chatterbox does not attract many of the hipsters cruising Mass Ave which often makes it possible to find a comfy seat and a good spot to see the band. NDY™ is pleased to make the Chatterbox one of our recommendations. 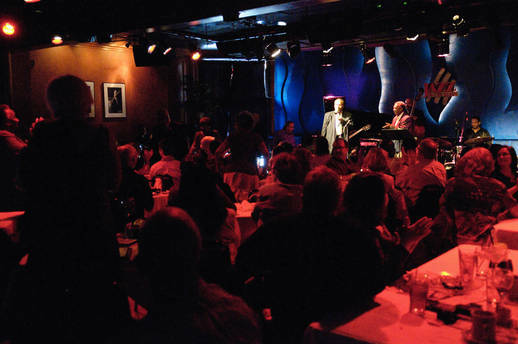 Indianapolis’s premier jazz club, The Jazz Kitchen is the polar opposite of The Chatterbox. It is slick, professional and attracts both international and local jazz musicians to its stage. Dinner is available, but the restaurant is not what makes the Jazz Kitchen a travel destination. It’s the music, which the Jazz Kitchen takes very seriously, having atavistic roots in jazz going back to the early twentieth century. Thursday night shifts from mainstream jazz to the Latin Dance Party, as a DJ spins your favorite Salsa and Meringue tunes for your dancing pleasure. Caliente! When you get too hot from all that shimmy, the club has an outside patio and deck for chilling. Downbeat Magazine, quintessential reading for any jazz aficionado, named the Jazz Kitchen one of the top 100 jazz clubs in the World. A diverse, eclectic crowd shows up to enjoy the sweet sounds making the Jazz Kitchen a NDY™ recommendation. 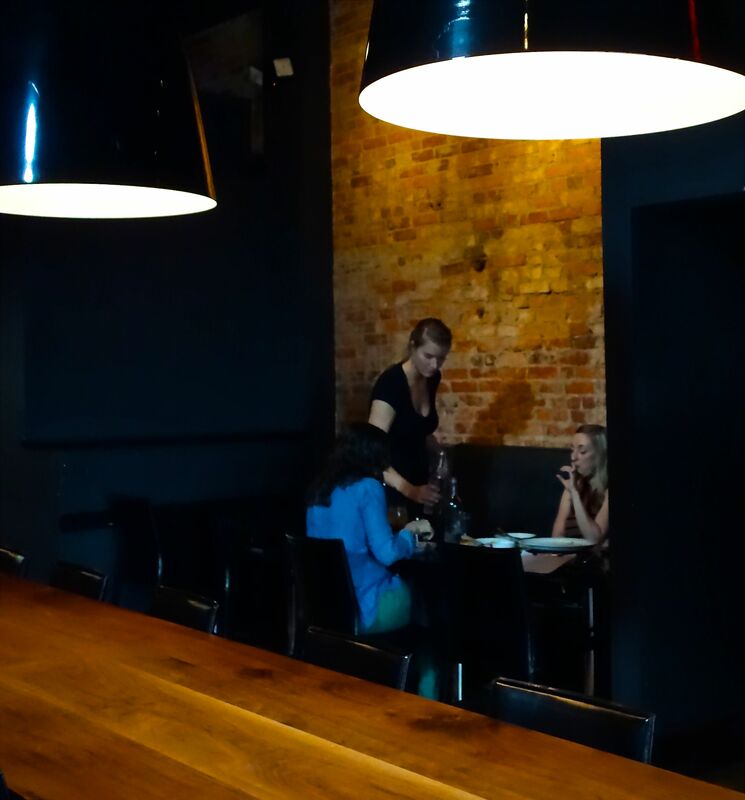 CAVEAT: The Jazz Kitchen, even with a reservation for two, will sit you with another couple at a table for four. It is forced intimacy at its most uncomfortable. Please be prepared. Located in downtown Indy, right on Monument Circle, the Cabaret at the Columbia Club provides a touch of elegance and sophistication to Indianapolis. 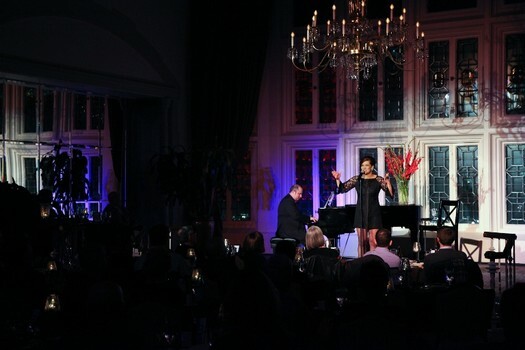 Following the path laid down by such venerable institutions as the Oak Room at the Algonquin Hotel and Feinstein’s at the Regency, the Cabaret at the Columbia Club provides a venue for not only the internationally known vocalists, but also for locally grown talent. The historic Columbia Club has the perfect ambiance to “do the swank” and enjoy a classy night out on the town. While cabaret may not be considered hip or trendy in the classic sense, the NDY Generation™ will stick out our neck and proclaim that the trendies are missing out on a very chic form of entertainment. This kind of nostalgic cabaret scene is as cool as donning a shawl collared tux while holding a Macallan, straight up in a Glencairn cut crystal glass. You in the Bottega Veneta black sheath cocktail dress know what the NDY Generation™ is talking about! The NDY Generation™ is not going to exhaust itself with the typical and the obvious. The major museums, sports teams, monuments etc. are easy to find and collect information on. NDY™ will seek out the uniquely special things to do that sets a place apart. Every city, country, island has its own identity and personality. Part of the great fun of travel, kind of like developing a deeper personal relationship with someone, is discovering those traits that lie under the surface, that makes a destination sway in its own breeze. Indianapolis has its sports teams: the NFL Colts, the NBA Pacers, and a fun minor league baseball team, the Indians, that play in a charming ball park. Of course, the Indianapolis Speedway, home of the famed Indianapolis 500, is one of the best known sights in the city. There’s an art museum, zoo, repertory theater etc that might also interest you. However, these are not what the NDY Generation™ is looking for or recommending. “Hanging out” is one of the favorite things NDY™ loves to do anywhere and at any time, and we will begin with the best places in Indianapolis for the NDY Generation™ to just be. There are several neighborhoods that the city public relation mavens refer to as “cultural districts.” NDY™ finds this to be a bit of a marketing stretch, and most of the so-called cultural districts did not receive the NDY™ recommendation. Broad Ripple Village, the Wholesale District were nondescript and would not interest the NDY Generation™. Most people would never use the word “Bohemian” to describe Indianapolis, but if there was one area of the city with an “arty” vibe, it would be Massachusetts Avenue. Running in a diagonal from Monument Circle, Mass Ave began gentrification in the nineties and it is still in the midst of an urbane development. Crisscrossed with cool boutiques, galleries, restaurants and bars (see above), Mass Ave is both a day time and night-time destination. Condos are springing up on both the main drag and on the side streets. 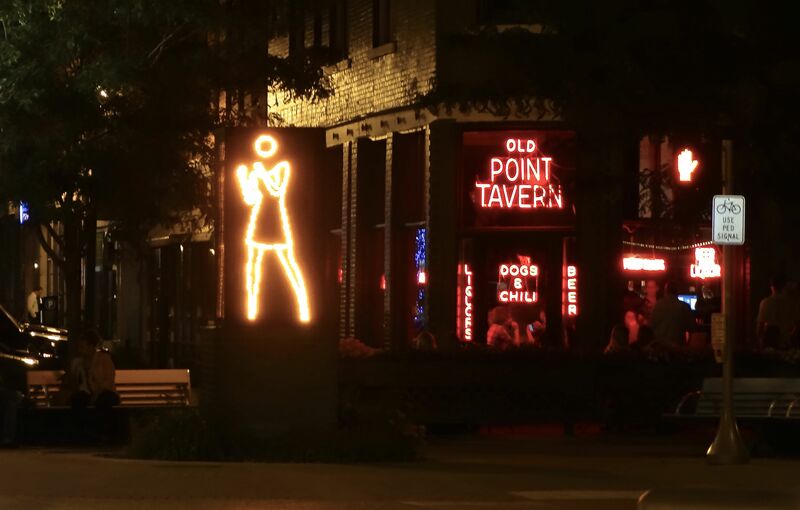 This is definitely the hip side of planet Indianapolis, but Massachusetts Avenue has an eclectic acceptance of all tastes, including the NDY Generation™, and many of the restaurants, bars and boutiques reflect a NDY™ aesthetic. Those of you who paid attention in their social studies classes will remember how the United States economy, buoyed by the building of the Erie Canal, envisioned a national canal system connecting the great river ways of this country. While some of these canals were built, others were started and simply ran out of money or time. The state of Indiana began building a system of canals that they envisioned would connect the Wabash to the Erie Canal and on to the Ohio River. Unfortunately, the project ran out of money and was halted in 1839. 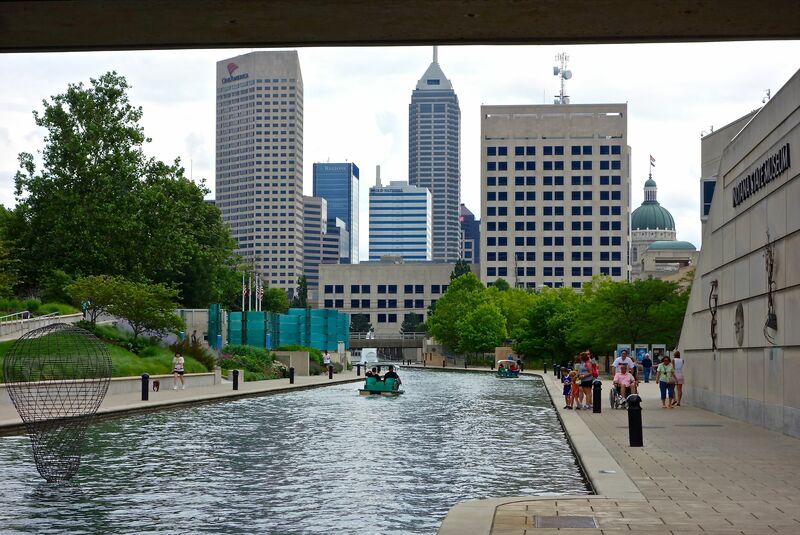 Eight miles of the canal were built-in and around Indianapolis, and the city has taken great advantage of this water way. 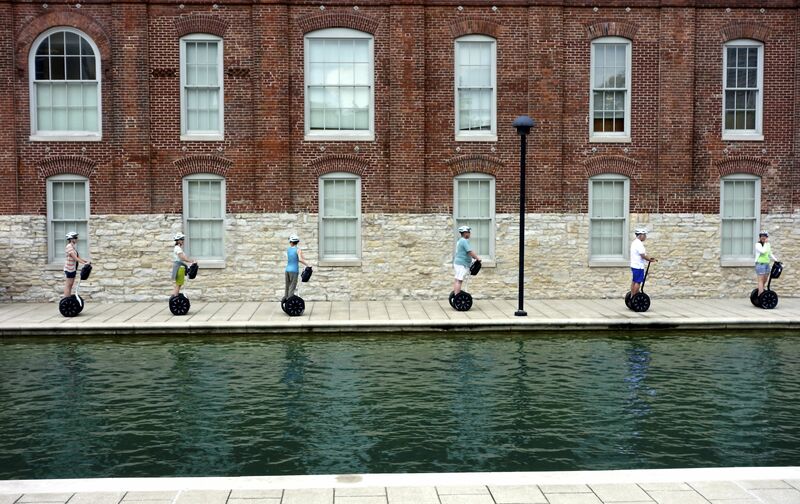 NDY™ was particularly enamored with the urban canal which winds its way in a serpentine manner through downtown Indy. Walkways, gardens and sculpture line the canal which seemingly runs underneath the city, providing a bucolic respite from the metropolitan hustle and bustle. Although the city could use more cafes, restaurants and bars developed along the way, there is access to hotels, museums and sights from the canal. Pedal boats can be rented in good weather and gondolas ply the canal adding a bit of Venetian charm to the city. The canal is a quirky and fun part of Indianapolis that needs to be discovered by more people and thus, is a NDY™ recommendation. 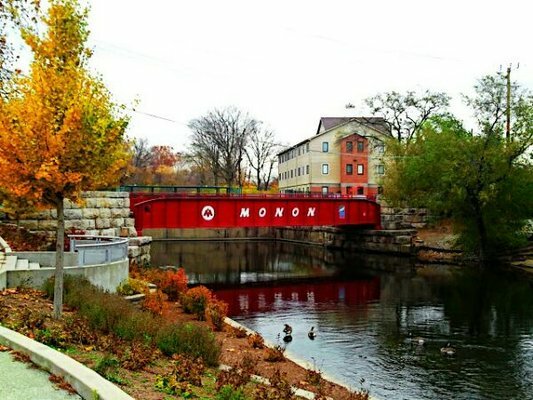 The Monon Trail is an abandoned rail line of the Indianapolis-Chicago main line that has been developed for biking and hiking enthusiasts. It is considered by many to be one of the best developed rail to trail projects in the world. 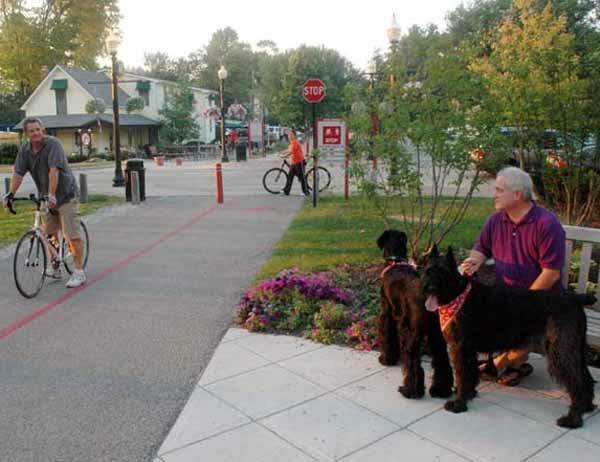 What makes the Monon so unique is that it encompasses nature lovers as well as urban walkers. 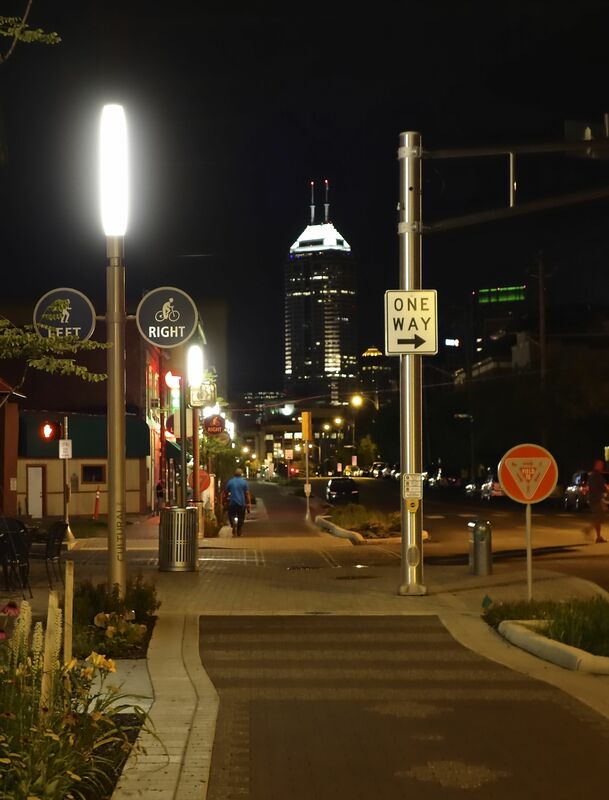 Ten miles of the trail stretches from downtown Indianapolis to Carmel, passing through the Broad Ripple cultural and shopping district. The Monon continues for about five miles more to the town of Carmel (see below) and then extends five miles beyond Carmel. Businesses, restaurants and cafes line the trail while pedestrian walkways, nature walks, and city sights meander off the Momon in different directions. Attention and money has given the Monon Trail mile markers, art work, and some sensitive grooming. It is an Indianapolis treasure and a NDY™ recommendation. Located 30 minutes from downtown Indianapolis, Carmel, pronounced like you were telling someone named Mel to get your car, is often chosen as one of the best places to live in the US of A. It certainly is clean, safe, and affluent; also a bit “white bread,” but if that’s your sticky bun, enjoy. 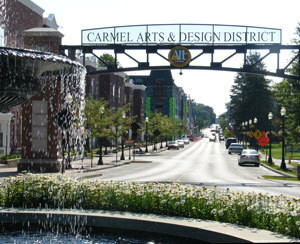 There certainly is a lot to do in Carmel (pron: /karmel/ – remember) with its Farmer’s Market, Monon Trail (see above), Arts and Design District, Japanese garden and all the cute restaurants and boutiques. Doubtless, if Norman Rockwell or Herbert Hoover were to design a town, Carmel would be it, and NDY™ must admit, in spite of our proclivity for hip and cool, Carmel is darn nice. Everybody has that rosy cheek, healthy enthusiasm and everything looks substantial and well thought out. What truly makes Carmel a NDY Generation™ recommendation is the Center for the Performing Arts, consisting of the Tarkington, a 500 seat proscenium theater, the Studio Theater, an intimate performance space, and the fantastical, out of this world Palladium, an opera like concert hall by way of 16th century Vicenza, Italy. 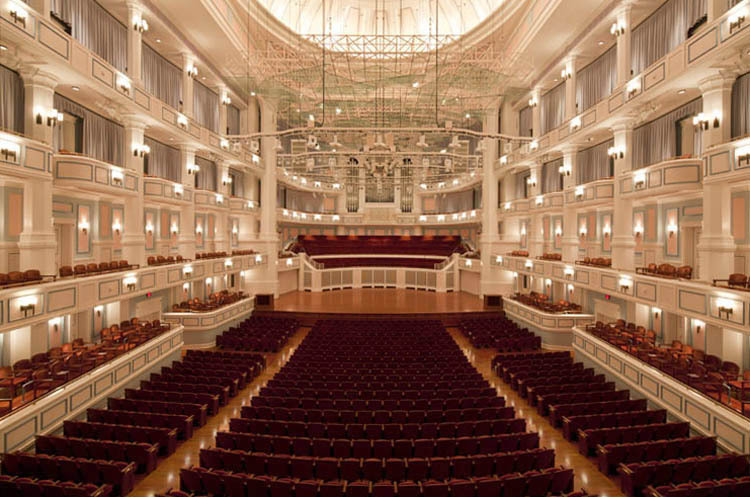 While both the Tarkington and especially the Palladium may have you believe that Liberace and Mussolini somehow collaborated on their design and architecture, there is no disbelief about the acoustics and the tremendous talent they bring to Carmel. Under the motivational leadership of the great Michael Feinstein, not only were these venues built, but performances by world-famous jazz musicians, internationally recognized classicists, broadway stars, award-winning thespians, and pop icons are seen and heard in tiny Carmel, Indiana. It is truly amazing and not to be missed when in the area. 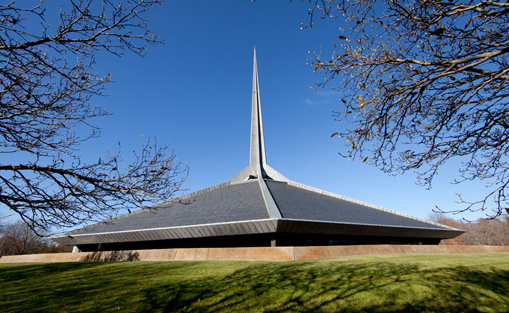 A few minutes short of an hour, south on Interstate 65, is a hidden travel gem for any fan of modernist architecture. Columbus, Indiana would be iconic if it was on either coast. A town of less than 50,000 people, Columbus invades the senses with its incredible architecture, model blueprint, and sensitive aesthetics. 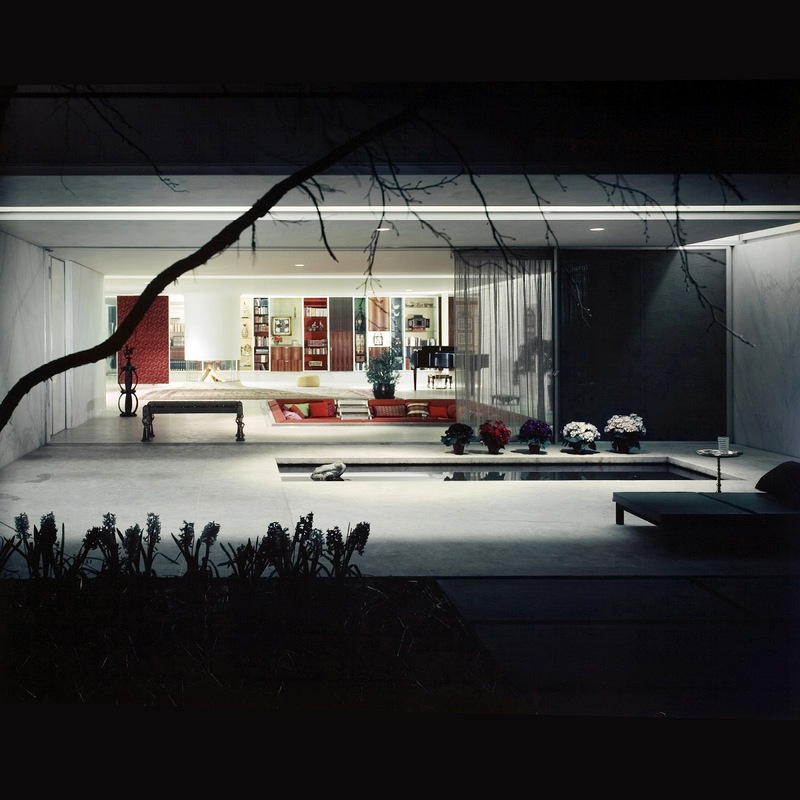 This sleepy, archetypal Indiana town luxuriates with buildings designed by the absolute greats of modernism: Eero Saarinen, I.M. Pei, Robert Venturi, Cesar Pelli, Richard Meier, just to name a few. The public art, urban planning, and the charming shops all add to an amazing experience. Columbus would have none of this if it wasn’t for the vision and leadership of J. Irwin Miller, former CEO of the Cummins Corporation, who is one of those individuals that make you realize how inadequate most of us are. He was amazingly generous, talented,and successful while keeping it all in perspective, emphasizing what is actually important within a framework of values and philanthropy. If you get overwhelmed by all the art and culture, there is even a designer outlet mall to check out, located about 10 minutes away, off of Interstate 65. Chain motels proliferate near the mall, and the Intercontinental Hotel Group constructed an Indigo Hotel, what the company markets as a branded boutique lodging, in the heart of Columbus. NDY™ thinks the Indigo is a fine place to stay, but don’t expect a New York or Parisian boutique hotel experience. The Indigo is very reasonably priced and a step up from a motel. If you want the optimum Columbus getaway, stay at either the Inn at Irwin Gardens or the Ruddick-Nugent House. (has no relationship with Ted Nugent) These two historical Bed and Breakfast style lodgings, are beautifully restored, but do not have up to date twenty-first century conveniences and be aware that a B & B is not a hotel or motel. Familiarize yourself with what a B & B entails before you dive right in. There are good places to dine in Columbus, but nothing that would receive a NDY™ recommendation on its own. Columbus is undervalued as a destination and I have not even mentioned how great the Miller House and Garden Tour is. I could have spent all day just at the Miller House. It was amazing! Before you spend all that money venturing to Bilbao, Barcelona or Brasilia, spend a couple of days in Columbus, a passport not required. It is a treasure.